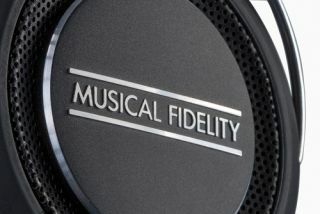 Musical Fidelity unveils MF-100 overhead headphones | What Hi-Fi? Musical Fidelity has announced a new pair of overhead headphones, the MF-100, for £119. The British manufacturer claims they provide 'clear, natural sound' and 'the same studio-quality sound Musical Fidelity has become renowned for'. The MF-100s are the firm's first pair of overhead cans, adding to the current repertoire of two sets of in-ears. We reviewed the EB-50s earlier this year, but felt that they were a tad overpriced for the sound they offered. However with the MF-100, Musical Fidelity aims to give the wearer a lifelike sound, allowing them to immerse themselves in the music they are listening to. The drive units have been designed from scratch and are said to give a 'very flat and wide frequency response with low distortion'. The styling is up to usual Musical Fidelity standards, with helpings of leather around the ears and a soft-touch frame. Some Alcantara earpieces are also available to ensure a comfortable fit and a tight seal. To keep up with current trends, an in-line microphone is provided to allow for hands-free calling, and the earpieces fold away for safe and secure storage. The MF-100s will be in stores by the end of the month.